If you have a good memory you may remember in the article: Fire Safety at Work that the average office exceed fire regulations due to the tonnes of loose paper scattered throughout the office. 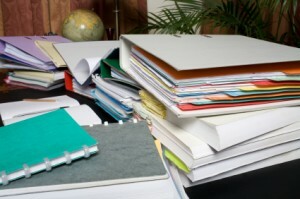 So one way to help increase safety in your office is to cut down on the use of paper by going as paperless as possible. True, in some contexts your business may be unable to achieve this, and in some cases all you need is a little creativity to get results. For example, one company who supply reports to property investors was printing out and posting numerous paper reports each week. To avoid use of paper (and to cut down on the expenses of printing) the company decided to offer electronic reports that they could email to the individuals. Assuming that only a few people would opt for the electronic version, the company was pleasantly suprised that 90% of their customers supported the paperless option. Are there ways you can offer a product or the paperwork associated with it in an electronic format? use handtowels and teatowels instead of paper towels. In one medium-sized business (22 employees and 6 managers/supervisors) each staff member has their own handtowel. One cheery soul volunteered to take the towels home twice a week and wash them. Everyone seems happy with the arrangement – even the washing person! And REMEMBER… back up your computer, electronic diary, etc. regularly! Brilliant. i am in the midst of going paperless so this is more incentive. Remember backups too.